Getting a charter bus rental quote for Chicago is just the first step to exploring this wonderful city. Chicago, the City with Broad Shoulders, creates a vision of a hardworking, blue-collar, industrial center. While the hardworking nature of the city’s residents remains, Chicago has transformed itself into one of the world's most cosmopolitan and cultural metropolises. Replete with vertical gardens, glass skyscrapers, dozens of museums and world-class restaurants, Chicago offers all visitors, and certainly all charter bus visitors, a wondrous and exciting experience. Visitors cannot help but be taken in by the friendliness of local residents and beauty of the miles-long, lakefront parks. It is no wonder why Chicago has quickly vaulted to many of the country's "best of" lists. Be sure to take the time to see what America's "Second City" has to offer travelers and consider charter bus rentals for a unique experience. The grounds that now are part of the city have been continuously occupied, going back nearly 1,000 years. Indian tribes including the Potawatomi, Miami, Sauk and Fox have called this area home. American settlers moved in at the end of the 18th century and secured their foothold on the area with the erection of Fort Dearborn in 1803. The demarcation lines of the original fort can still be seen, while walking on Michigan Avenue. Whether it is for business or pleasure, Chicago offers visitors hundreds of attractions and thousands of top-shelf restaurants. The city also features first run musicals, plays, and operatic events. In fact, there is not a single week that passes, without a major event or exposition taking place. Visit our top 10 fun things to do in Illinois page for some great ideas! Chicago features some of the most unique attractions in North America. For art lovers, there are several dozen art institutes and galleries. The most famous of these is the Art Institute of Chicago, located on Michigan Avenue, opposite Grant Park. The museum has several dozen permanent and rotating exhibits. The Ancient and Byzantine collections include thousands of ancient Roman coins, pottery, art, and sculptures. The ancient Egyptian collection rivals similar collections found in London, United Kingdom and Alexandria, Egypt. 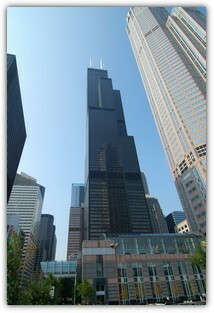 The Willis Tower, formerly known as the Sears Tower, stands as the tallest building in North America. At over 100 hundred stories and over 1,400 feet in height, the building towers over nearby edifices. Willis Tower features a sky deck that is open to the public. From atop the tower, visitors can see four states (Michigan, Illinois, Indiana, and Wisconsin), on a sunny day. If you are up for a little adventure and are not afraid of heights, Willis Tower's sky deck has the option for visitors to see what it feels like to literally stand in the clouds, with their virtual ledge experience. Make this a stop on your bus charter tour of Chicago, Illinois. The Field Museum of Chicago is not to be missed on any bus charter tour. This landmark building houses some of the greatest fossils in the world, including the gigantic T-Rex dinosaur nicknamed "Sue." The assembled dinosaur skeleton towers several stories into the air. It is on display, alongside several other exhibits and collections, including an extensive meteorite and mineral collection, and an unparalleled American Indian exhibit. The American Indian exhibit displays some of the oldest and most fragile relics, including leatherwork and beadwork. Being the architectural capital of the United States, Chicago continues to outshine other contemporaries. Some of the most incredible design projects are being developed within the confines of the city. (It's often fun to rent a bus for a tour of the city's varied architecture. Get a bus charter quote today.) The Trump International Hotel & Tower and the recently completed Elysian Hotel and Condo buildings are two of the newest additions. Chicago is the regional charter bus rentals hub for the Midwest. Multiple bus charters are available daily and depart to cities near and far. Several popular routes include service to Lake Geneva, Wisconsin, Wisconsin Dells, Wisconsin, and Galena, Illinois. Charter bus departure times and dates will vary, depending on the charter bus operator. Local bus charters to various points of interest, including suburban casinos and zoos are frequently run. Charter bus connections to nearly all Midwestern cities are available for rental; including Detroit, Indianapolis, Des Moines, Green Bay, and Cleveland operate daily. Charter bus rentals to smaller cities are also available. Start your day with a hearty breakfast at Nookies on Wells Street in the Lincoln Park neighborhood. This delectable establishment has been a local favorite, since the early 1970s. Be sure to try one of their giant-sized omelets. When visiting, be aware that Nookies does not take reservations. It is not surprising to expect a 30 - 60 minute wait and a line going outside the restaurant. It is well worth the wait (Just make sure your charter bus is waiting for you!). Chicago is known for its Chicago-style pizza and hot dogs. Without a doubt, Lou Malnatis pizzeria needs to be added to any visitor's restaurant list. Their deep dish pizzas are gobbled up by locals and visitors alike. Be sure to try their pepperoni and sausage deep dish pizza. The exquisite taste will send meat-lovers to second heaven. For lighter fare, do not pass up Kamehachi, Chicago's premier sushi and Japanese restaurant. They now have four locations within the downtown and near north areas of the city. Be sure to try the daily, sushi chef specials. They are unique, mouthwatering and sure to leave an impression. If you are more of a meat and potatoes person, then head over to Gibson's Bar and Steakhouse. They serve up some of the city's best dry-aged steaks. The restaurant is located in the heart of the Gold Coast neighborhood. Do not be surprised if famous sports personalities show up at a table next to you. The restaurant is beloved by the city's stars, businesspeople and athletes. Before attending one of Chicago's top theater venues, stop by Petterino's for an early dinner. Hundreds of famous celebrities have made Petterino's their theater dining choice. Nearly every wall of the restaurant is replete with the photographs of local, national and international celebrities and VIPs, who have had the privilege to dine at Petterino's. Be sure to try their Chicken Piccata dish. Locals swear by it. Chicago is known as a true melting pot of different ethnicities. This diversity is well-represented in the choice of ethnic restaurants. Two favorites are the upscale Nacionale 27 and the authentic Russian Tea Time. Both excel in providing unique and scrumptious dishes seldom found in other big cities. Russian Tea Time is conveniently located less than a block away from the Art Institute of Chicago. While Chicago is packed with events, activities and attractions, neighboring towns and cities provide special alternatives and are often good choices for charter bus tours and/or stops. One such alternative is the water sports retreat known as Lake Geneva, Wisconsin. Many Chicago residents and tourists make the annual trek across the border, to enjoy a more tranquil setting. Lake Geneva is located roughly 2 hours north of Chicago. Family-oriented tourists may want to explore Naperville, Illinois, ranked as one of the most family-friendly cities in the country. Naperville, hosts a children's museum, a local college, and a pristine river walk, replete with manicured landscaping, restaurants and more. If you want to take a step on the wild side, be sure to visit Brookfield, Illinois. Brookfield is host to one of the largest zoos in the world: Brookfield Zoo. When visiting, be sure to arrive early and be prepared to spent the entire day walking the endless acres of habitats and exhibits. If finding the best bargain is more your style, visit Gurnee, Illinois. Gurnee has one of the largest shopping malls in the Midwest, with hundreds of stores in and around the mall. Discount and outlet stores like Marshalls, Saks Off Fifth and others have taken up residence there. One of the Chicago land area's best kept secrets is the city of Zion, Illinois. Founded over 100 years ago, the entire city was built upon a master plan. The center of the city has parks, a golf course, aquatic center and more. By far, its biggest draw is the miles of beachfront and pristine forests of the Illinois State Beach. It is not uncommon to see deer roaming, within eye sight of the picnic areas and beach. Unlike Chicago, whose beaches are completely packed, during summer months, the Illinois State Beach allows visitors the privacy and peace seldom available. During the summer months, Chicago explodes with activity. Festivals and street fairs can be found in many of the city's neighborhoods each weekend. 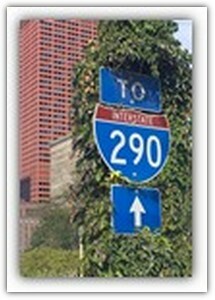 Chicago also hosts several, world-renown events. Each weekend and several times during the week, weather permitting, the city sponsors a "Concerts in the Park" series. The Chicago Symphony Orchestra and other musical performers play at the Petrillo Band Shell, located opposite of Millennium Park. Classical, international, and contemporary are just a few of the music selections that can be heard. For many, Chicago is the one and only home for Jazz. The city's annual Jazz Festival takes place in the early summer months and lasts for several days. Tourists from around the world have flocked to the city for the rare opportunity to watch and listen to jazz legends like Miles Davis, Ella Fitzgerald, Benny Carter and others. Although the Chicago Jazz Festival draws tens of thousands of visitors each year, no festival compares to the Taste of Chicago. The week-long event, sponsored by the city and dozens of private businesses, draws more than one millions attendees each year. Well over one hundred of the city's top restaurants and eateries set up offer tastes of their cuisine. Top bands perform to packed audiences. The event takes places throughout Grant Park, located on the shores of Lake Michigan. During the frigid city winters, the Lincoln Park Zoo puts on an event called Zoo Lights. The entire zoo is decked out in holiday lights. The event takes place in the month of December. It serves as a free and family-friendly venue, and draws thousands of visitors and suburban residents into the city arrive by bus or car. If you were searching for a charter bus service or to get a quote for a charter bus rental in Chicago, you've come to the right place.